Our current campaign is about claiming our human right to health care. We should all be able to get the care we need, when we need it, without going broke. The long-term goal of this campaign is to pass legislation that insures health care is a universal, publicly-financed human right for everyone in Pennsylvania. Everyone gets sick. We all have bodies, and we all need care. At some point in our lives any of us may need dental care, vision care, mental healthcare, reproductive care, elder care, gender related care, and other forms of care. Currently, our healthcare system doesn’t treat us as whole people. We have a patchwork system in which healthcare is a commodity and not a right. Our ability to secure quality care of all kinds for ourselves and our families is largely dependent on our ability to pay. It also depends on whether we live in a city, a suburban or a rural area, whether or not we’re inside a jail or prison, our race, gender, age, and immigration status. Just like we need a healthcare system in which healthcare is a right and a public good, we need a movement to secure such a system where we all come together to get everything we need. If we keep advocating around different pieces of the healthcare system, in different communities, we can’t build enough power to transform the whole system. Put People First brings together all of our communities to win one of our most basic needs and build a movement not for “coverage” but for care. In 2017 we won Healthcare Town Halls in communities across PA for public comment as part of the insurance rate review process conducted by the Pennsylvania Insurance Department. In 2016 over 600 people came together to win the first public hearing on ACA/Obamacare rate increases in Harrisburg since the law’s implementation. In 2016 we produced the report Beyond Coverage: Putting People First in PA’s Health Care System, based on hundreds of interviews with PA residents about their experiences with health care. In 2015 held our first statewide Leadership Institute on organizing skills, and held Healthcare Know Your Rights workshops across the state. In 2014 we joined the fight to expand Medicaid in Pennsylvania. 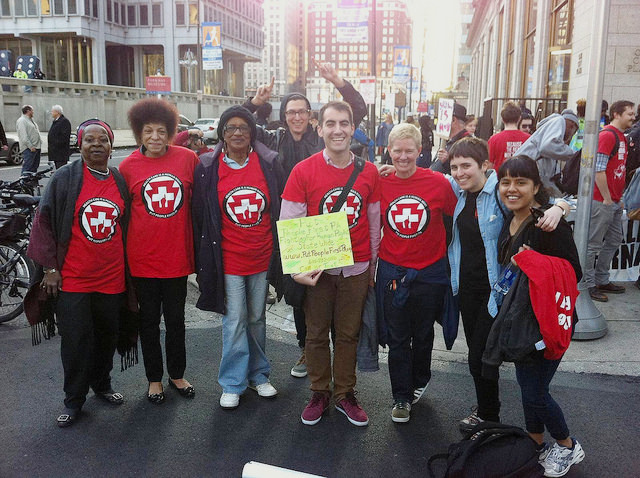 In 2013 we endorsed the call for a new Poor People’s Campaign for today. We know that a different health care system is possible. Put People First! PA believes that only a grassroots groundswell of those most impacted can transform our healthcare system to one that puts people above profit. Want to be part of this campaign? Learn how to get involved.